Digital or paper planners or both? What do you use? 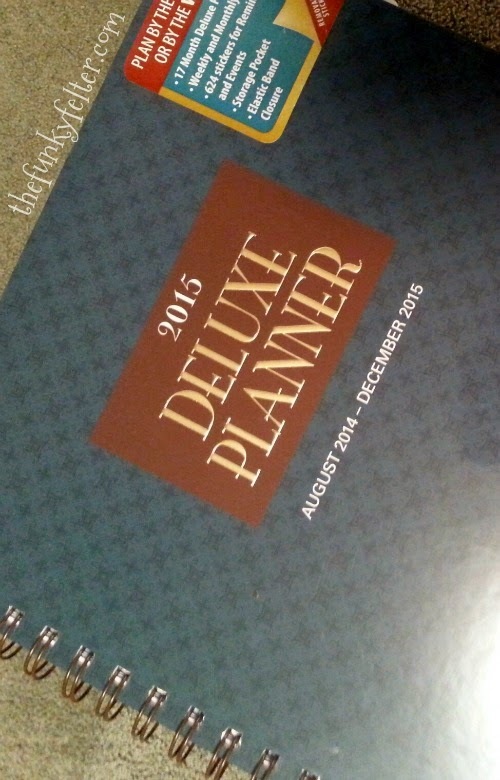 When I saw this 2015 Deluxe Planner on the shelf at my daughter's school during a mini book fair, I could not resist. I have had a love affair with paper planners since junior high, and I still have some of those well-worn planners packed away in keepsake boxes. When I got a smartphone earlier this year (yes, I held out a long time on getting one), I was enamored by all the neat organizing, calendar and planner apps available. I've gone through using several over the months since I got my phone, but nothing has beat my love for a simple, hand-written paper planner. Ah, even the smell of it makes me happy. I must admit that I put my paper planner aside for a few months after I got my phone thinking that all digital was for me, but I missed it. I missed being able to shuffle through the pages to see what I did on the same day last month or make little doodle notes about projects or plans. Or, just using a good old No. 2 pencil to write neatly my appointments on the large block style calendar. When I saw this one, well, I just had to have it! I was using another one that I got on sale just a couple months before having realized how much I missed a paper planner, but that was just a fill-in. This one called to me with it's full page block style calendars, hard covers and, wait for it....pockets. That's what really got me, the front and back pockets. Do I still use my digital calendar? Oh, yes! It is wonderful to chime and remind me of events which I desperately need the prompt to remember. However, I will probably always use a paper planner too. Maybe it is a bit of nostalgia, or that I get to use my trusty No. 2 pencils with it, or doodle, but the new smell of a paper planner will always have a place in my heart.